I came across this photograph yesterday while continuing my long-term project to scan and digitally archive all of our family photo albums, a project which seems to go in fits and starts. Maybe I will have it completed by 2020. Anyway, I had not seen this one in a while, and found it interesting. This shot was taken in my little studio room in the house in Dover, NH, probably sometime in early 1984. It was actually a second floor bedroom, right at the top of the stairs as I recall. 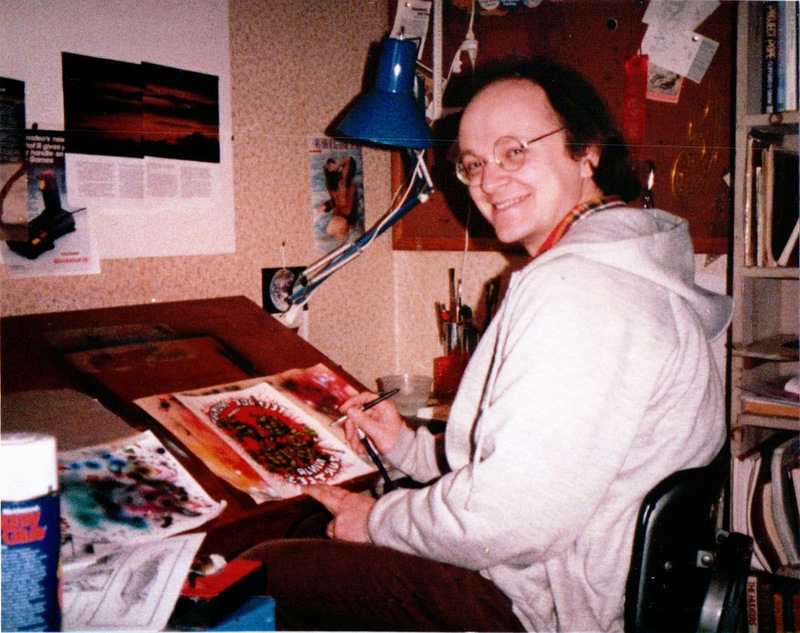 I don't recall working in that room a lot, but apparently I had my airbrush set up in there, and in this photo I am using the airbrush to do part of the coloring on one of the pieces of artwork we produced to make the TMNT t-shirt iron-ons which we sold in the early days of Mirage Studios. I can tell this by the fact that the lettering of "Teenage Mutant Ninja Turtles" on the piece is backwards, which was necessary so that when the iron-on was ironed on to a t-shirt, the writing would then be correctly oriented.